If you are unable to make the event, please join us on-line for a webcast of the event. Online guests will be able to participate in a question and answer session with Troy Paredes. 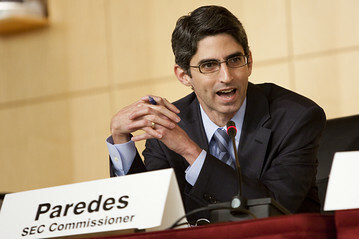 Troy A. Paredes recently completed his term as commissioner of the US Securities and Exchange Commission (SEC), serving throughout the financial crisis and its aftermath, during which time the SEC undertook numerous initiatives to restructure the regulation of financial markets, including the SEC advanced rule makings to implement the Dodd-Frank Act and the JOBS Act. Before his government service, Mr. Paredes was a professor of law and a professor of business (by courtesy) at the Washington University in St. Louis. He has also been a visiting professor of law at UCLA and Georgetown. He practiced law in California at O’Melveny & Myers, Steptoe & Johnson, and Irell & Manella, where his practice focused on financings, mergers and acquisitions, and corporate governance. He is the author of numerous academic articles and is a coauthor of a multivolume securities regulation treatise, Securities Regulation.